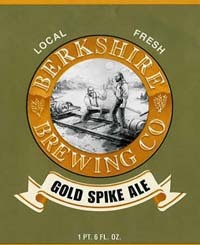 The Golden Spike Ale pours a small white fizzy head with a light golden body. With fair lacing, the head was fully diminishing. Without noticing the sediment at the bottom of the bottle, some ofd the pourts were cloudy and some were clear, but with active carbonation. The nose detected a faint bread malt aroma with hints of yeast. The initially light bitter taste remained the same for the light bitter finish for an average duration. With very active carbonation on the palate, the Golden Spike had a light body with a crisp taste. It was very drinkable. Comments during the review: "It's pretty good" - Curley Stout.